Parcel collection and delivery service franchise Fastway Couriers won the Franchise of the Year (Service) Award at this year's Irish Franchise Association Awards. 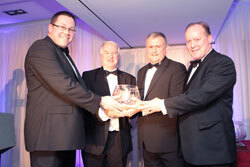 Winning the Award tops Fastway Couriers' most successful year to date. The company secured a two and a half year contract for all Irish parcel deliveries of Littlewoods Ireland, moving Fastway into the B2C market. Commenting on the Award, Andy Hennessy, joint National Master Franchise Owner of Fastway Couriers (Ireland), said: "We are delighted to win this Award which recognises excellence in franchising as well as success in the courier industry. We had a tremendous year in 2009, particularly in the context of a 30 per cent decline in the parcel delivery sector last year. Apart from our business success and service to our customers, we also take pride in the support we provide to all our franchise owners throughout the 32 counties. In 2009, the Franchise Support Office provided over 500 on-site support visits to all regions." Gerry Riordan, joint Master Franchise Owner of Fastway Couriers (Ireland), added: "The Award also reflects our strong positioning in terms of our strategic plan for growth for the next three years. We aim to become the 'Courier of Choice' for home delivery retailers. This plan reflects our ability to build on our presence in this emerging market and this Award acknowledges the hard work and dedication of all our staff and franchise owners."